Trouble viewing this email? Click here to view online version. 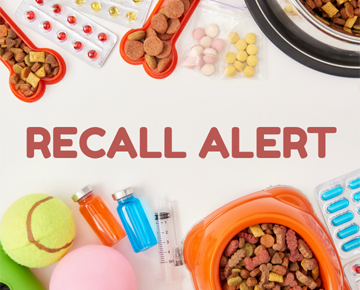 Hill's Pet Nutrition has recently expanded their pet food recall announced in late January to include additional canned dog foods. If you feed any canned Hill's Pet Nutrition canned dog foods, please check them against the list below and take appropriate action. Hill’s Pet Nutrition is voluntarily recalling additional select canned dog food products due to potentially elevated levels of vitamin D. While vitamin D is an essential nutrient for dogs, ingestion of elevated levels can lead to potential health issues depending on the level of vitamin D and the length of exposure, and dogs may exhibit symptoms such as vomiting, loss of appetite, increased thirst, increased urination, excessive drooling, and weight loss. Vitamin D, when consumed at very high levels, can lead to serious health issues in dogs including renal dysfunction. Pet parents with dogs who have consumed any of the products listed and are exhibiting any of these signs should contact their veterinarian. In most cases, complete recovery is expected after discontinuation of feeding. The affected canned dog foods were distributed through retail pet stores and veterinary clinics nationwide in the United States. No dry foods, cat foods, or treats are affected. Not all Hill's canned dog foods were affected. Pet parents who purchased the product with the specific lot/date codes listed should discontinue feeding and dispose of those products immediately. To have discarded products replaced at no cost, please contact Hill's via their website or at 1-800-445-5777. Pet owners should discontinue feeding these recalled products and contact their veterinarian. For further information, please contact Hill’s Pet Nutrition, Inc. at 1-800-445-5777 Monday-Friday during the hours of 9am-5pm (CST) or at contactus@hillspet.com. The current list of potentially affected diets is listed below, but we strongly recommend checking the Hill's recall list on their website, too, for the most up-to-date list. If you're feeding your dog any of them, please immediately discontinue feeding the affected food and check the manufacturer's website to determine if the UPC numbers on your products are associated with the recall at this time. The manufacturer or retailer can direct you about options for disposal and refunds. Contact us immediately at 312.583.1921 if you have any health concerns for your dog who has been eating these foods. Please be prepared to provide a full diet history for your dog, including the specific foods fed and provide the lot number (take a picture to make it easy). (Products newly added to the expanded recall are in bold italics). Thank you for trusting Metropolitan Veterinary Center with the care of your pet's health. This electronic communication is being sent to you by VINx on behalf of Metropolitan Veterinary Center - 1556 S. Michigan Ave, #100, Chicago, IL 60605 USA. (800) 454-0576) If you don't want to receive these types of emails, click here to unsubscribe.